In these lessons, we will learn how to simplify expressions by adding or subtracting like terms (combining like terms). An algebraic expression consisting of like terms can be simplified by adding or subtracting the coefficients of the like terms. Step 2: add or subtract their coefficients. How to identify like terms and combine like terms? Two or more like terms are like terms if they have the same variable (or variables) with the same exponent. To combine like terms, we add or subtract the coefficients. The variable factors remain the same. Which of these terms are like terms? 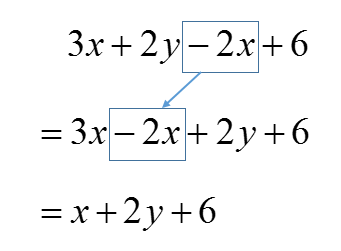 Simplify each polynomial, if possible. This video shows how to simplify algebraic expressions by combining like terms by adding, subtracting, and using distribution.